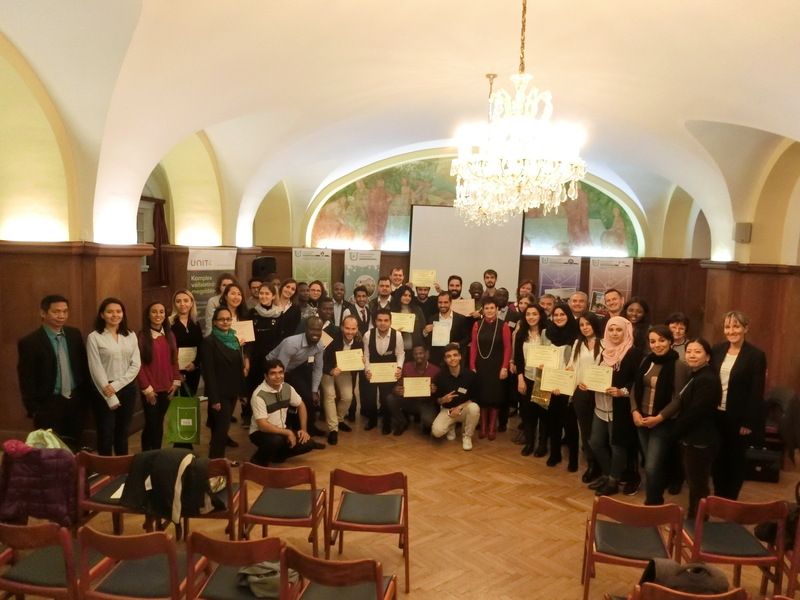 VUA YOUTH scientific student conference took place on 20 November 2018 on the premises of the Szent István University, Gödöllő, Hungary. The event was jointly organized by VUA and the University. This year 28 students presented their research work in 3 sessions related to the theme of the conference. The sessions were visited by 65 people. Thanks to active participation and contribution of VUA members from Ukraine, Russia, Slovakia and the host university, students from 17 countries (Algeria, Azerbaijan, Colombia, the Gambia, Ghana, Hungary, Kazakhstan, Mali, the Philippines, Serbia, Syria, Slovakia, Somalia, Tunisia, Turkey, Ukraine, Yemen) shared their research results with the members of the committees and the audience that created excellent environment to learn more about those countries and to deepen the professional cooperation. VUA Presidency would like to thank the participants and the organizers for all their hard work! The annual scientific conference organized for bachelor, master and PhD students will be held at the Faculty of Economics and Social Sciences of the Szent István University, Gödöllő, Hungary under the auspices of the Visegrad University Association on November 20, 2018. The aim of this conference is to provide a forum for the bachelor, master as well as doctoral students of VUA institutions to present their research results at the conference and to have a publication in a conference proceeding with ISBN. Professors and lecturers from VUA institutions will constitute the scientific committee whose role will be to give guidelines to the students regarding the continuation of their researches. This conference also provides platform for young researchers not only from the CEE region to meet their counterparts and build new professional relationships. 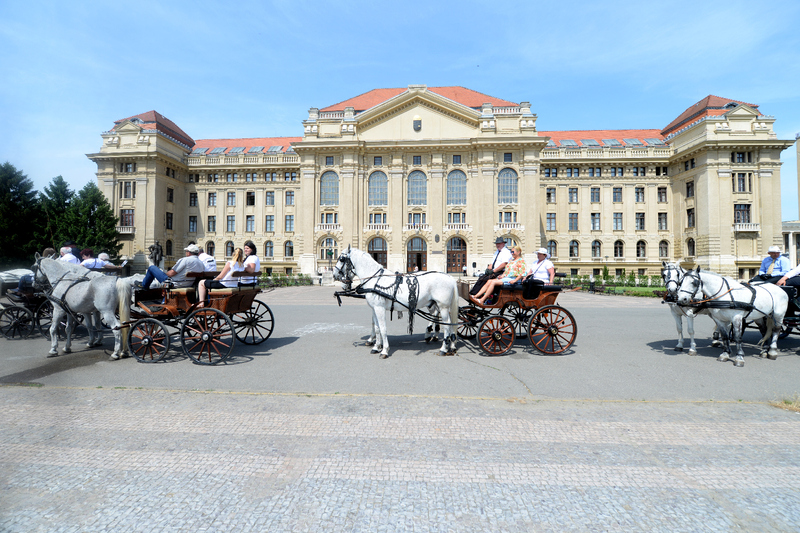 The meeting organized at the Faculty of Agricultural and Food Sciences and Environmental Management, University of Debrecen, Hungary was attended by almost 40 representatives of VUA member universities and institutions. General Meeting was opened by Prof. Akos Pinter, Vice-rector of the University of Debrecen, VUA President Prof. Peter Bielik and Prof. Istvan Komlosi Dean of the Faculty of Agricultural and Food Sciences and Environmental Management, University of Debrecen. Presentations of invited speakers provided the GM participants with valuable information on the topic of Accomodating new methods and topics in Agricultural Higher Education. Dr. Susanne Lehnert (Universit of Bonn) gave a speech titled “The One Health Concept in the Curriculum”. Prof. Tibor Mezei (Szent Istvan University) presented a topic “The Internet of Things in Agricultural Education, the Gödöllő example” and Dr Csaba Fogarassy (Szent Istvan University) prepared a presentation “The Implemetation of the Circular Economy Concept in the Curricula”. VUA Presidency would like to the Faculty of Agricultural and Food Sciences and Environmental Management, University of Debrecen for a perfect organization of the event and all the participants of the General Meeting for their fruitful contribution. 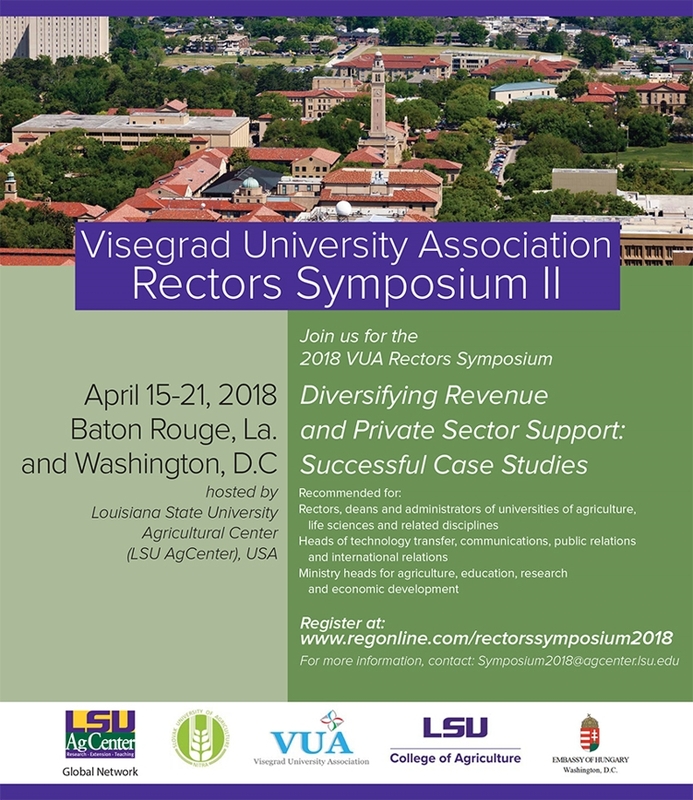 LSU AgCenter Global Network in tandem with Visegrad University Association and V4 support represented by Hungarian Embassy to the US recently held the second Rectors’ Symposium 2018 designed to examine case studies of diversifying revenue and private sector support for institutions of higher agricultural education. The Symposium was held April 16 through the 20th, marking the second year of the Rectors Symposium. The design of this year’s Symposium first took place in Louisiana State University Agricultural Center in Baton Rouge, LA and finalized with The Hungarian Embassy to the United States in Washington D.C. The purpose of this year’s Symposium was to crate an intensive educational program with private sector collaborators (Bracy’s Nursery, A.Wilbert’s Sons, LLC) which emphasized the importance of public-private partnerships in the production of sugar cane, timber products and ornamental horticulture. Second part of the Symposium, organize by The Hungarian Embassy to the United States in Washington D.C provided activities and presentations that highlighted the global impact of these partnerships. The Rectors Symposium provided many positive results for all 24 participants. Among the many results, five new Memoranda of Understanding between various universities and institutions were executed. EURAXESS representative Viktoria Bodnarova provided comprehensive information about potential funding sources, Director of Hungarian Chamber of Commerce, Bela Kocsy provided overview of opportunities to connect with private sector, and the Czech Agriculture and Commercial Attaches in the US Peter Jezek and Ludek Moravec outlined environment for university – private sector cooperation and needs. During the second part of the Symposium, H.E. 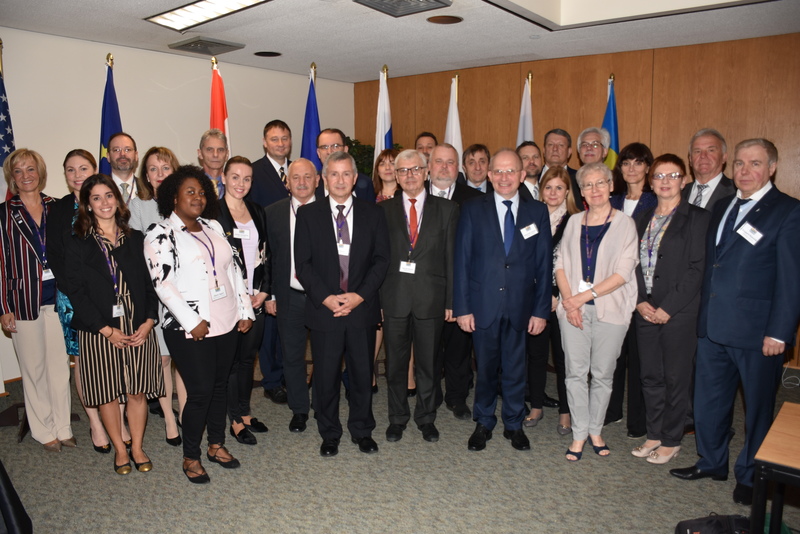 Laszlo Szabo, Hungarian Ambassador to the US welcomed and hosted the group, thus, providing multiple networking opportunities and chances to identify next steps in future collaboration. 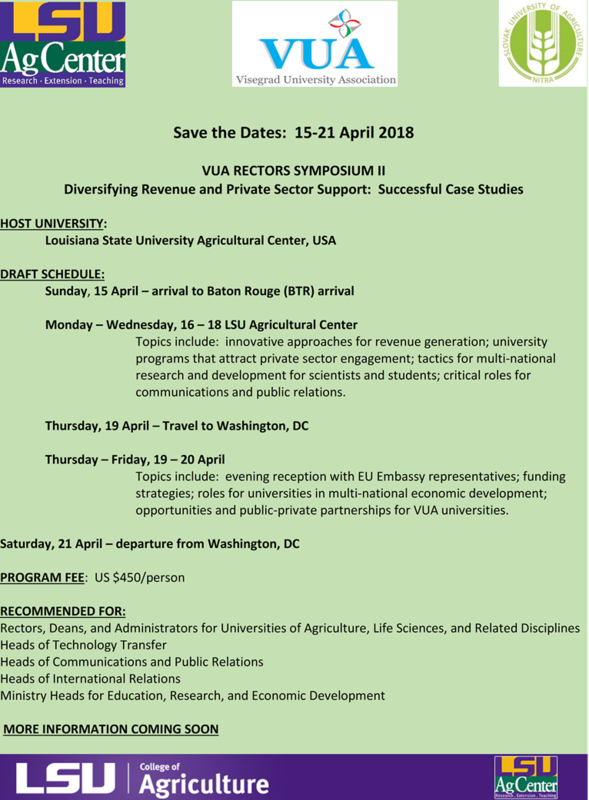 Louisiana State University Agricultural Center welcomed the opportunity to host this wonderful Trans-Atlantic event! VUA Presidency would like to thank the organizers for all their hard work and efforts. Continuing the successful series of VUA YOUTH conferences of the past few years, this year 56 students in 3 sessions had the opportunity to present their research results during VUA YOUTH on 22 November 2017 in Gödöllő at the Faculty of Economics and Social Sciences of the Szent István University. VUA, since its establishment, has considered the support of students and young researchers as a key priority. Due to the active participation and contribution of VUA members and the host faculty, students from 23 countries (Afghanistan, Azerbaijan, South-Africa, Egypt, Ghana, Jordan, Kazakhstan, Kenya, China, Poland, Mexico, Myanmar, Moldavia, Nigeria, Russia, Palestine, Serbia, Syria, Slovakia, Somalia, Turkey, Ukraine, USA) shared their research results with the members of the committees and the audience that created excellent environment to learn more about those countries and to deepen the professional cooperation. VUA Presidency would like to thank the organizers for all their hard work and efforts! Kursk State Agricultural Academy and Belgorod State Agricultural University are glad to invite you to participate in the summer school "AGRISUMMER IN BLACK SOIL REGIONS OF RUSSIA" jointly organized by two educational institutions of higher professional training in Kursk and Belgorod regions. In 2018 the school will be held on July, 30 - August, 12. Students will have a wonderful opportunity not just to study different aspects of agricultural science, such as horticulture, dairy production, agricultural production processing etc., but also to visit agricultural enterprises in order to see with their own eyes how Russian agribusiness is organized as well as to compare the tendencies of agricultural production in different regions of Russia. The programme includes presentations and seminars, as well as practical classes and field experience. The working language of the school is English, German interpretation will be provided when necessary. The programme will last 14 days and the students will receive 4 credits for 44 academic hours of lectures/presentations combined with professional excursions to agricultural and food production enterprises. Use your chance to visit the leading agricultural enterprises of Belgorod and KurskBelgorod regions and to experience Russian culture and hospitality! 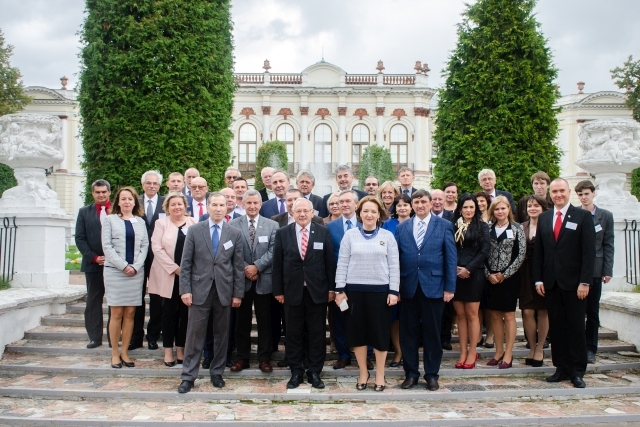 General Meeting of Visegrad University Association 2017 took place at Russian State Agrarian University - Moscow Timiryazev Agricultural Academy (RSAU-MTAA), Russia on September 13-15. The meeting was attended by more than 40 representatives of 20 VUA member universities coming from 10 countries. 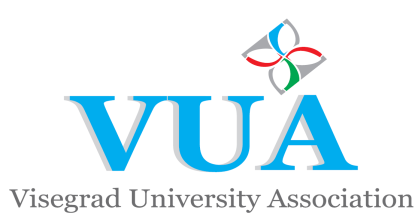 Traditionally, VUA AWARD OF EXCELLENCE was awarded to the most active member university based on the results of the election of the General Meeting. The award went to Louisiana State University, USA as the appreciation of active participation in VUA activities. The award was presented by Prof. Peter Bielik and Dr. Galina Zolina to Prof. John Russin. Presentations of invited speakers provided the GM participants with valuable information on selected topics. Head of Department of Agroeconomics of the Moscow State University of M.V. Lomonosov Prof. Sergei Kiselev focused his speech on the impact of the climate change and food embargo on agricultural development in Russia and Europe. He pointed out possibilities to ensure Russia's food security in climate change conditions up to 2050. Security expert Alexander Golikov talked about potential risks of GMO production. He stressed that the issue of increasing safety is directly linked to rapidly evolving technologies. Sergei Groshev, Head of agribusiness projects at Singenta, focused on issues of mutual partnership between the state and private sector in agricultural education. He talked about the experience of training agricultural experts in agrotechnology and suggested creating a community that would help to create similar training centers. VUA Presidency would like to thank Russian State Agrarian University-Moscow Timiryazev Agricultural Academy for a perfect organization of the event and all the participants of the General Meeting for their fruitful contribution.